Guests galore and what a pleasure it was to meet many of them either at their Guest Spotlight panels or at the posh Meet the Guests Reception. Below are many well-known facts about each of the attending guests for this year's Fanime Con 2001. Mr. Hiroshi Aro c/o Studio Ironcat at the Meet the Guests Reception: producer of various sci-fi and romantic comedy mangas, his latest manga work is entitled "Miwagari Accident" (The Accidental Substitute). Some of his work includes Character Designer for Luna Valgar, Tottemo Shonen Tankentai (Very Boys Explorers), and Futaba-kun Change. Mr. Kunihiko Ikuhara at the Meet the Guests Reception: esteemed head of BePapas studio and most visibly known for his blonde locks much to the enjoyment of female anime fans, Mr. Ikuhara brought with him a long history of working on several anime, including one of the anime series directors of Sailor Moon and director/co-creator of the anime series and movie Revolutionary Girl Utena. Mrs. Amanda Winn-Lee at the Meet the Guests Reception: theatrically trained voice actress extraordinaire brought not only examples of her vocal skills but also solid experience in directing and script writing at ADVision. Her english vocals include such popular characters Rei Ayanami of Evangelion, Gally of Battle Angel, and Rally of Gunsmith Cats. Mr. Gilles Poitras at the Meet the Guests Reception: a long standing member and religious father of several West Coast anime clubs and author of two popular books "Anime Companion: What's Japanese in Japanese Animation" and "Anime Essentials: An Introduction to Anime" published by Stone Bridge Press. 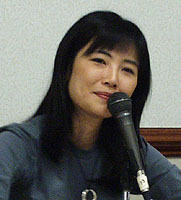 Ms. Mari Iijima at her Guest Spotlight panel: nominated for Best Pop Artist at the 2000 Los Angeles Music Awards for her first English music album "No Limit", Ms. Iijima is also more popularly known for her voice actress work as Lynn Minmei in the Macross TV series and movie as well as American shows Pacific Blue and Spyder Games. Check out her website at: www.marimusic.com Mr. Hiroyuki Yamaga at the Meet the Guests Reception: best known for his work behind Royal Space Force: The Wings of Honneamise as writer and director and co-producer of Neon Genesis Evangelion, Mr. Yamaga helped arrange directorial seminars for the fans and gave information on the full-length director's commentary track on the Royal Space Force DVD from Manga Entertainment. 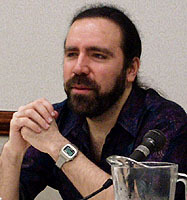 Mr. Adam Warren at his Guest Spotlight panel: one of the most popular and internationally admired American manga artists, he brought with him his well-known experience of master artistry of such long-running series like Dirty Pair, Bubblegum Crisis, Gen 13, and numerous pieces for Playstation and Wizard magazines. Mr. Stan Sakai at the Meet the Guests Reception: creator of the lovable Usagi Yojimbo manga series published in America by Dark Horse Comics, Mr. Sakai brings with him past successes including receiving numerous honored awards including the Parent's Choice Award, Inkpot Award, three Eisner Awards, and two Spanish Huxtur Awards. Greg Weisman: Supervising Producer and Supervising Story Editor for Disney's "Gargoyles", Mr. Weisman is also known for his work on "Men in Black", "Max Steele", "Starship Troopers", and "3x3 Eyes". Fred Schodt: Master translator of countless Japanese manga and books, he is most popularly known for his work on the "Gundam" novels, "Manga! Manga! ", and "Dreamland Japan: Writings on Modern Manga" and has received Japan Cartoonists' Association Special Award. Allen Hastings: Emmy-award winning creator of LightWave 3D which has been used in such works "Blue Submarine Number 6", "End of Evangelion", "Babylon 5", SeaQuest DSV", and countless TV commericals. Doug Smith: Working with Steve Bennett at Studio Ironcat, Mr. Smith has voice acted for such anime like Golden Boy, Dragon Knight, Sorcerer Hunters, Super Atragon, Burn Up W!, Plastic Little, and Slayers. Taliesin Jaffe: American TV actor and anime voice actor and voice director for such works as Nazca, Amazing Nurse Nanako, and many upcoming projects for New Generation Pictures and Pioneer Entertainment. Steve Bennett IV: Cofounder of Studio Ironcat and one of the most popular American guests around the nation bringing with him his cel-painting workshop and experience on numerous published translated Japanese manga titles. Jonathan Klein: Cofounder and coowner of New Generation Pictures that does sub/dub production work for Pioneer, Urban Vision, Central Park Media, and The Right Stuf. Jason Lee: American voice actor who has worked on "Blue Seed", "Burn Up W", and "Evangelion" and has also formed his own dub production company Gaijin Productions with his wife Amanda Winn-Lee. Jonathan Osbourne: American voice actor with experience on such popular anime titles including "Gundam 0080: War in the Pocket", "Cowboy BeBop", "Akira", "Gundam 0083: Stardust Memories", and "Gundam 08th Team". Mr. Fred Patten at his Guest Spotlight panel: he brings much experience to share for today's anime fans: San Diego ComicCon's Inkpot Award for helping start anime fandom in America, one of the founders of the Cartoon/Fantasy Organization, and has written countless articles and notes for Starlog, Fantastic Films, Manga Max, Animation World Magazine, Rhino Records, Viz Communications, and many more. 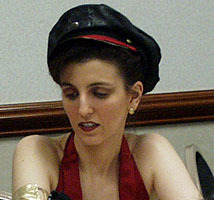 Ms. Tiffany Grant at her Guest Spotlight panel: a super-talented lady, she brought with her experience of voicing over 100s of anime characters, some most notably Asuka of Evangelion, Kome in Blue Seed, Becky in Gunsmith Cats, Ryoko in Nadesico, and Dug Fin in Dragon Half. She has also worked on many non-anime Japanese and American films gaining tons of theatre, commercial, and industrial film experience. More info about Ms. Grant can be found here.